When my Dad was still in the Air Force, he was very much what you could call an officer and a gentleman. He was known for his principles of justice and fairness; and was also known around the service as one who knew how to take care of the simple people who worked with him. As such, Dad was well-respected and developed healthy and lasting relationships with not only his fellow officers, but also with enlisted personnel and casuals who came into the Base on a day-to-day basis. One of those with whom he developed a lasting friendship was a mechanic who worked at the Base Motor Pool. They formed such a bond that the latter, when he got married, took my Dad to be his godfather. Theirs was not only a professional relationship; it also became a very personal one, particularly after the wedding. Kuya Roding, as we all learned to call the mechanic, became very much a fixture at our house in the Base. He not only took care of the jeep that was issued to Dad by the Air Force; he also ensured that our family car was in top condition all time. My Mom also took a liking to Kuya Roding. In a way, he was like another son to him. He was a jolly, fun-loving person to be with; and everyone was comfortable having him around. He went with us whenever the family went to Nasugbu for weekend visits; joined us when we went to beaches and resorts for family outings; and attended fiestas with us whenever he was available. One of these trips was a long drive to this obscure lakeside village called Mamatid. I honestly cannot recall whose house it was we went to, or how Dad – or Mom – came to know the owners; but what I do recall is that we went for a town fiesta. For those who do not know – and I am reasonably certain many of you really do not – Mamatid is a tiny village in the Laguna municipality of Cabuyao. Back when we went – this was the late sixties – the village was known for its duck-raising industry. One could tell that one was getting near because the lakeside breeze brought with it the unmistakable smell of ipot as well. My recollection of the visit is, quite understandably, rather hazy. It has been four decades since. 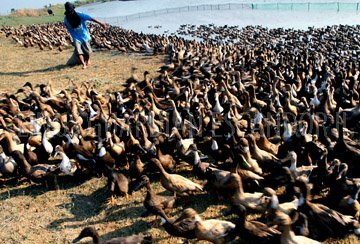 I remember we arrived late afternoon and that I was fascinated to see so many ducks of various colors all in one place. I also remember being told that the ducks were raised not so much for their meat but more for their eggs, which were then processed into balut. Mamatid – at least, in those days – was very much balut capital of Laguna. Of course, what fiesta would be celebrated without the delicacy served in abundance – and for free! After eating standard fiesta food, there really was not much left to do but wait for Dad and Mom to be satiated with their kwento. Now, that was where the problem was; the night was deepening and neither Dad nor Mom were showing any inclination to leave for home. I was, apparently, not the only one who was feeling bored. Kuya Roding and my brother, who like me did not have anything in the way of entertainment, decided to amuse themselves by engaging in a balut-eating contest. I helped myself to a couple of baluts; albeit, in those days, I would only sip at the sabaw inside the shell; enjoy what remained of the orange yolk; and chew at the rubber-textured egg white. The sisiw I threw away. Back then, I just couldn’t! In college, I did learn to do so; but only in the dark and by forcibly shutting out images of a feathery creature squirming between my teeth! The contestants were not as squeamish and consumed everything inside each shell. Of course, there was kwento as well between baluts. I remember being amazed that the two just went on and on. I already felt quite cloyed with the only two that I ate. When it was time to go, my brother had nine; and Kuya Roding had seven – or was it the other way around? Dad and Mom were amused and we laughed about the contest on our way home. Mom did warn that the balut was masustansiya and could cause problems later. 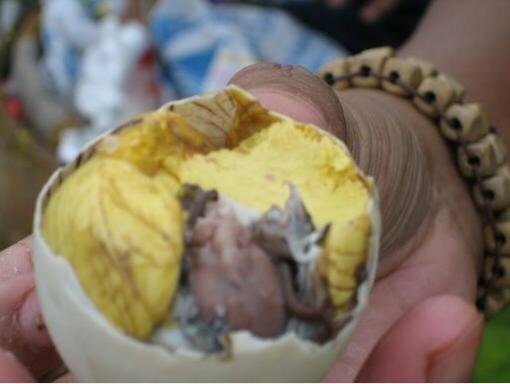 That was the reason, she said, why the balut was given to those who donated blood to the Red Cross. My brother could not even get up from bed. It made him dizzy when he tried to get up, talagang hilong-hilo. I think he stayed there for, at the very least, the morning. Mom laughed it off, of course! She immediately knew that it was just the balut getting even; particularly as my brother bore no fever or any other alarming symptoms. Kuya Roding, an adult, had no such reactions. I think he even had a few beers to go with the balut as well. He was back at the house early the next morning like he usually was and even managed to tease my brother about his predicament. As for me, I was just mystified by the contest to begin with. The couple of baluts I had the previous night was actually more than what I normally ate in one sitting. Nine? I was a child, remember; but even then I thought it was foolhardy.